SO YOU WANT TO CUSTOMIZE YOUR OSD? We all love customization, especially when it comes to our quads, amiright? And as you may or may not know, BrainFPV flight controllers have a graphical OSD, (unlike any other racing flight controller in existence), which makes it possible to show custom graphics in the OSD. However, doing so proved to be an extremely difficult task which involved recompiling firmware, etc. Super difficult...UNTIL NOW, Y'ALL! They don't call us "Brain"FPV for nothing. BrainFPV is proud to introduce to you the worlds first drone racing OSD with customizable logos: BrainFPV Logo Customizer! WHAT? ARE YOU PEOPLE MADE OF MAGICAL GENIUS UNICORNS? Yes, Billy. Yes, we are made of pure exotic beast. What Logos Can I Use? Splash Screen Logo (TOP) This logo is shown on startup and when arming your quad. It's a great way to show your custom logo or team logo. You can create as many splash screen logos as you want and share them with others. Pilot Logo (BOTTOM) This is your own personal logo that is intended to display your "pilot name" on the bottom of the OSD. Once you have set your pilot logo, it will automatically be included in all the logo files you download. How Do I Make My Own Logo? To make a logo, use your favorite image editor, e.g., GIMP or Photoshop, and create a new image with a transparent background. For the splash screen logo, the size has to be 300 x 160 pixels, whereas the pilot logo is 240 x 60 pixels. 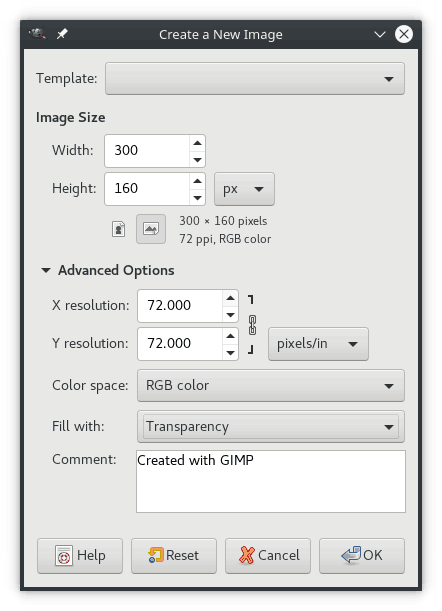 The example on the right shows the "New Image" dialog in GIMP for a splash screen logo. Note how the size has been set to 300 x 160 and "Fill with" is set to "Transparency", which creates an image with a transparent background. After creating a blank image, you need to edit the pixels. The OSD can only display black and white pixels, so make sure to only use black and white. All other colors are automatically converted to black, white, or transparent when you upload the image. So it may not look like you expect if you use other colors. In the following, we create a simple logo with just some text. First, write some text some text in black using the text tool. Make sure that "antialiasing" is disabled, so you will only get black pixels. To make text or graphical elements better visible in the OSD, it is a good idea to surround black elements with white pixels and vice versa. To do so for the simple text image, use the "Select by Color" tool to select the black pixels, grow the selection by a few pixels (Select -> Grow in the menu). Next, subtract the black pixels from the selection by pressing CTRL and clicking on the black pixels. This results in only the boundary being selected, which can then be filled with white pixels using the "Bucket Fill" tool. Naturally, there are many ways to create your image. You may also want to zoom in a set single pixels to black or white, or delete them until the logo looks good. When you do so, make sure to use a "hard brush" so you can toggle pixels between black and white and don't get gray scale values. Finally, save the image as a PNG file. Other image formats, such as JPEG etc are not supported. WHY WAIT? DO IT NOW! Use the forms below to upload your splash screen logo or pilot logo. Size: 300 x 160 pixels. If "Public" is enabled, the logo will be available for others to download. Please login first to submit your splash screen logo. Size: 240 x 60 pixels. Please login first to submit your pilot logo. To get the onto your BrainFPV flight controller, got to the logo and download the Betaflight HEX file. This file consists of the Betaflight firmware with your logos included. Use the Betaflight configurator to flash it onto your flight controller, like you do when updating the firmware. Splash Screen Logo Is shown on startup and when arming your quad by default. Use the OSD menu to disable "SHOW LOGO ON ARM" if you don't want the display the logo when arming. Pilot Logo If set, the Pilot Logo will be shown in place of the "CRAFT NAME" element in the OSD. You can use the Betaflight configurator to move the position of the craft name element. If you have the logo set but don't want to see if, use the OSD menu and disable "SHOW PILOT LOGO" and the normal "CRAFT NAME" element will be displayed. Can you customize the osd font? loading any font from windows 7 or 10….